Donatos recently provided pizza to these students at Washington Middle School as they celebrated “Pizza with the Principals.” This is in appreciation for their selection as Students of the Month for January. They are chosen by their teachers because of the outstanding example they set for their peers in such areas as academic effort, good work ethic, kindness to others and service to their school. Pictured (L to R): Logan Clevenger, Braden Johnson, Rylan Ellison, Audrey Lotz, (Troy Montgomery, Asst. Principal) Jayden Parrish, Kenzie Grossenbacher, Jason Wagner, Bryanna Teeters and Yukino Nagakura. 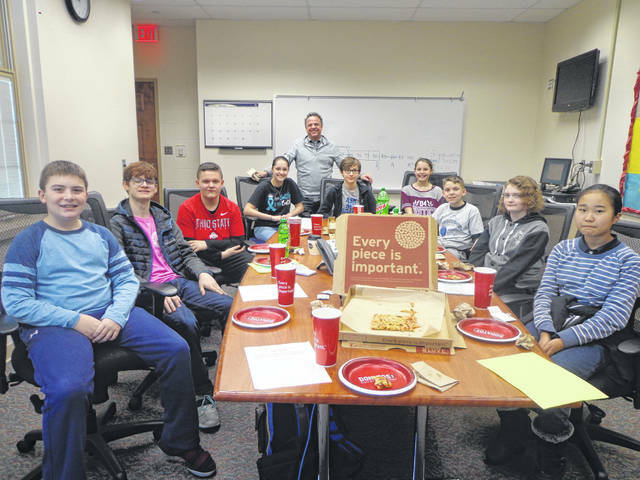 https://www.recordherald.com/wp-content/uploads/sites/27/2019/01/web1_DSC00081.jpgDonatos recently provided pizza to these students at Washington Middle School as they celebrated “Pizza with the Principals.” This is in appreciation for their selection as Students of the Month for January. They are chosen by their teachers because of the outstanding example they set for their peers in such areas as academic effort, good work ethic, kindness to others and service to their school. Pictured (L to R): Logan Clevenger, Braden Johnson, Rylan Ellison, Audrey Lotz, (Troy Montgomery, Asst. Principal) Jayden Parrish, Kenzie Grossenbacher, Jason Wagner, Bryanna Teeters and Yukino Nagakura.